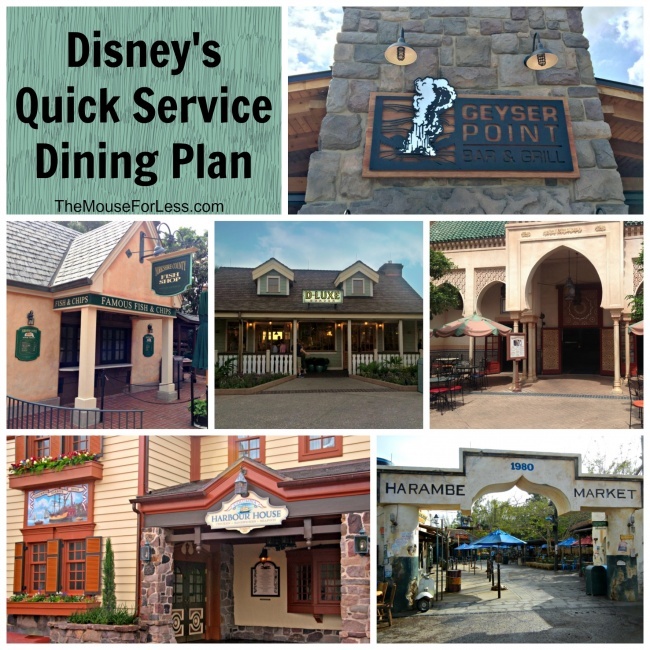 Disney’s Quick Service Dining Plan is perfect for guests who may be spending a lot of time in the parks, but don’t want to spend a lot of time at table service restaurants. Disney’s Service Dining Plan is perfect for guests who may be spending a lot of time in the parks, but don’t want to spend a lot of time at table service restaurants. Since 2018, Guests have several beverage options available including non-alcoholic specialty beverages and, for Guests 21 and older, beer, wine and cocktails. For 2019 the price of the Quick Service Plan is per person per night. Child rates are for ages 3-9. For each PACKAGE NIGHT in 2019, guests with this package will receive 2 quick service meals and 2 snacks. Plus guests will receive 1 resort refillable drink mug per person, per package. 2 Quick Service Meals One entrée and one non-alcoholic OR alcoholic (guests over age 21) beverage for Breakfast, Lunch and Dinner. 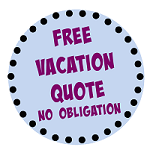 2019 vacation packages – Guests have several beverage options available including non-alcoholic specialty beverages and, for Guests 21 and older, beer, wine and cocktails. Alcoholic beverages can only be ordered with adult meal entitlements by Guests 21 and older. Alcoholic beverages cannot be ordered with child meal entitlements, even by Guests 21 and older. Guests younger than 21 may only order non-alcoholic beverages. Walt Disney World policy does not allow service of more than two alcoholic drinks per Guest 21 and older. Any item served in a souvenir container and any souvenir item considered to be merchandise. The dining location should offer a non-souvenir offering of the beverage and have a price for Guests to purchase the souvenir mug if they desire. Any item that is not a single serving, such as bottles of wine, pitchers, etc. There is no credit available to upgrade a beverage not included in the plan. The Guest must choose available beverages or they pay full price for the beverage that’s not included. The MouseForLess Shows You How to Save! Guests using this package can save on their dining expenses by using Disney’s Dining Plan. The examples below demonstrate the potential savings for a family of 4 with 2 adults and 2 children ages 9 and under, but parties of other sizes and ages may see similar savings. Uses 1 quick service meal per person. 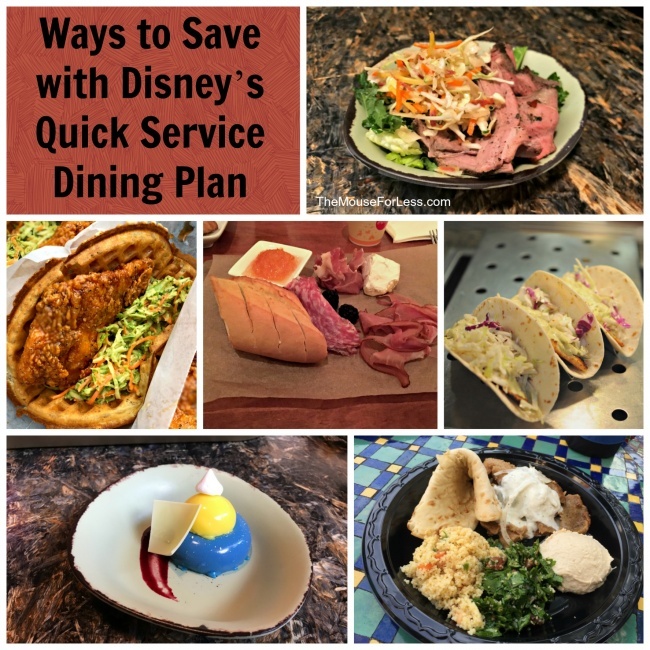 As you can see using Disney’s Quick Service Dining Plan can help guests save a significant amount. Have some fun and play around with the menus in our section to see how you could save using Disney’s Quick Service Dining Plan. You also may want to consider exploring Disney’s standard Dining Plan, and Disney’s Deluxe Dining Plan. If you have additional questions about Disney’s Dining Plans, we suggest that you book your trip with an Authorized Disney Vacation Planner like The Magic for Less Travel, the official travel agency of TheMouseForLess. The Magic for Less Travel has been named by Disney an Authorized Disney Planner. 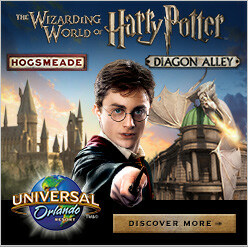 Their exclusive Magic Plus Concierge Service is provided free of charge to every guest. Agents working with The Magic for Less Travel are happy to help you secure Advanced Dining Reservations and help you create the vacation of your dreams. Visit our Best Value for Quick Service Restaurants page for a list of best restaurants on the Disney Quick Service Dining Plan.